Out on my regular run this morning I had a thought, not that its the only time I think, or that it was a singular thought but running does stimulate my thoughts - all that fresh air, sunshine and adrenalin! Anyway I was admiring some spreading bushes of Lantana, boldly flowering in yellows, orange, lavender and white and remembered that in Australia this is regarded as an invasive species. This set me thinking about how many plants we grow and appreciate in some countries but are regarded as noxious weeds in others. Some were first imported as choice exotics but then as we got to know their bad habits we have changed our opinions on them. Heavens knows how the adjective 'weedy' ever got the meaning of weak, as many of these are horticultural thugs. Here in the Coachella Valley, Pennisetum setaceum, the common fountain grass spreads far too rapidly and as a garden escape is threatening to colonise many of the desert areas. To those of us from the UK it may be surprising to know that Ailanthus, the tree of heaven, Arundo donax, the giant reed, Colocasia esculenta and Paulownia tomentosa, the foxglove tree are also regarded as invasive species in the USA. The exoticists amongst you will be shocked by the last three - stalwart constituents of an exotic border. Amazingly Agapanthus is on the invasive species list for New Zealand as is Acanthus and horror of horrors - Cortaderia - pampas! Maybe this blog needs an invasive species warning! 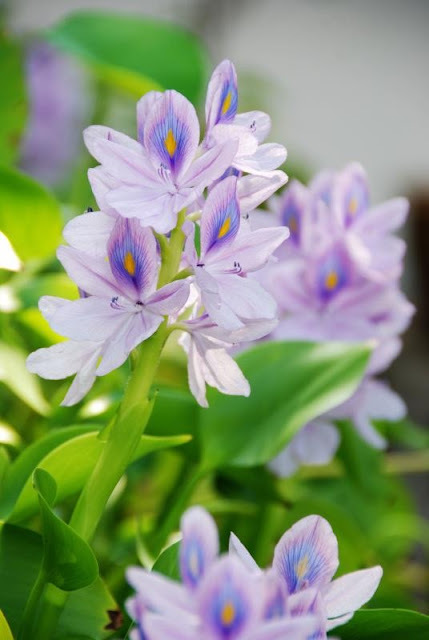 Many of us will also have admired the beautiful blue flowers and curious inflated green bladders on the water hyacinth, Eichornia crassipes, growing in tropical pools at botanic gardens. This too can be invasive in warm countries and has almost totally colonised Lake Victoria in East Africa. As well as generally blocking waterways it creates an ideal climate for breeding mosquitos. There has been some success with controlling it using insects which eat it. But its still beautiful! Back in the UK we have our own monster weeds. Most gardeners will have struggled with bindweed at some stage but it always comes as a surprise that it was first imported as an ornamental in the 19C. I have an old book back home with a pretty little picture of it in a hanging basket. The same is true of ground elder, Japanese knotweed, giant hogweed and Himalayan balsam - all imported by those most illustrious of gardeners, the Victorians! 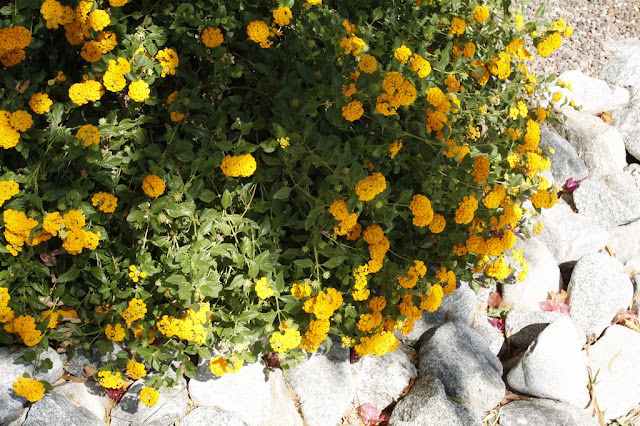 (Correction - ground elder actually introduced by Romans.) Little did they know of the problems they would cause for future generations of gardeners. 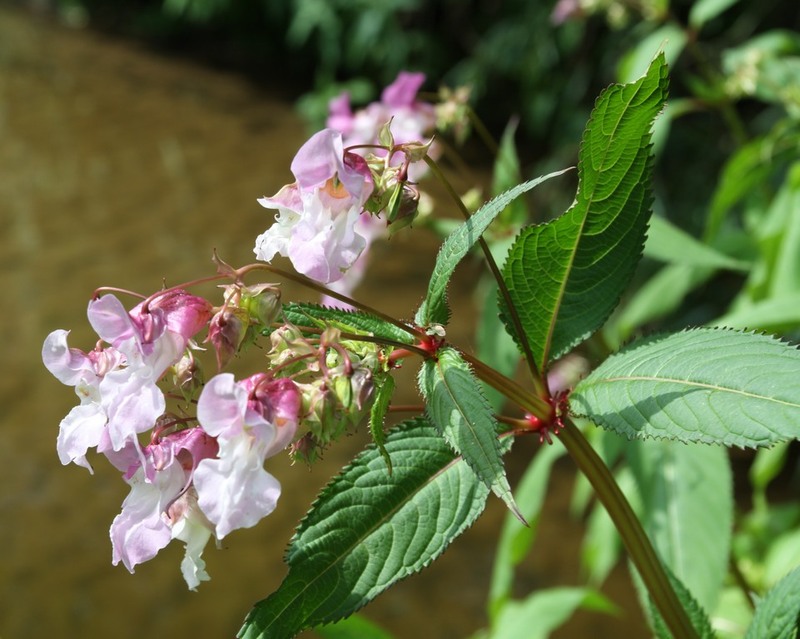 Eradication of Japanese knotweed remains an almost impossible problem and with the rapidly dwindling arsenal of herbicides available for use, its not going to get any easier. 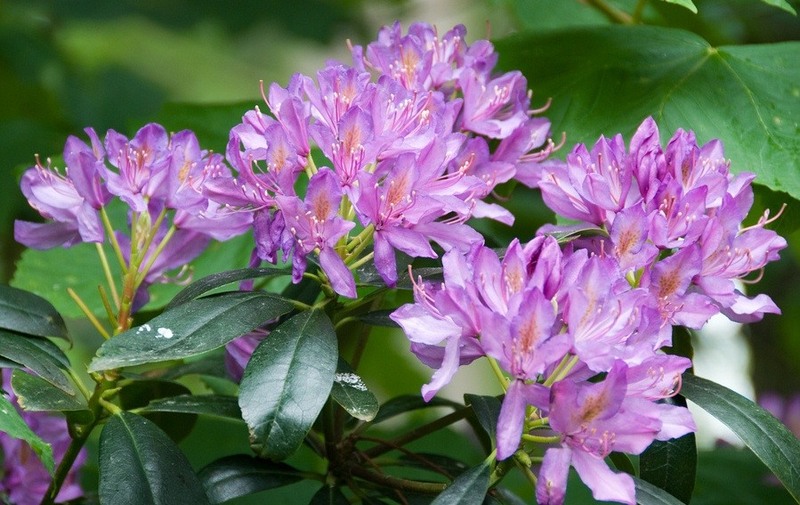 Rhododendron ponticum may appear to be an attractive plant when in flower but its dense evergreen foliage smothers all other growth in woodlands and prevents tree regeneration. The Forestry Commission in the UK now has a strong policy for its eradication. Sycamore, Acer pseudoplatanus is regarded by many as a weed tree. It spreads rapidly and produces a dense canopy, again preventing the growth of other species. Each mature tree is capable of producing many thousands of seedlings each year which perpetuate the problem It still amazes me that local authorities will place Tree Preservation Orders on this most undesirable of species. A few years back I decimated a whole sycamore woodland to the shock of the local University community. Check out these Flickr pics to see what we found underneath. 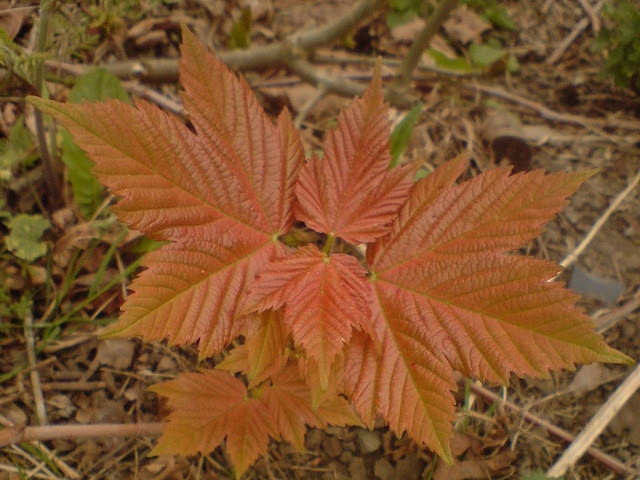 Sycamore seedling - looks harmless! Years ago I was taught that a weed is a plant in the wrong place but in some cases its not just chickweed in your chicory but aliens in the landscape! It's true that some of these 'weedy' weeds are actually very strong and are horticultural thugs! Bind weed we managed to put under control in our garden just by persistent pulling, we used to have loads but now we're down to an occasional appearance (which immediately gets pulled. Japanese knotweed, now that's a beast! But saying that I have the giant form (F. japonica Sakhalinensis) growing in a pot. But that's for the plant collector in me. Fascinating post. We suffer badly with bindweed and still battle it after 24 years of living here. I have a friend who has Japanese Knotweed, she is not allowed to remove any garden waste from her garden. Never thought of Sycamores as a weed! Libby - good luck with the bindweed - sadly its not going to get any easier - the EU are banning glyphosate, sold as Tumbleweed and Roundup. So silly as its such a safe herbicide! I'm surprised that Ground Elder was introduced...why? 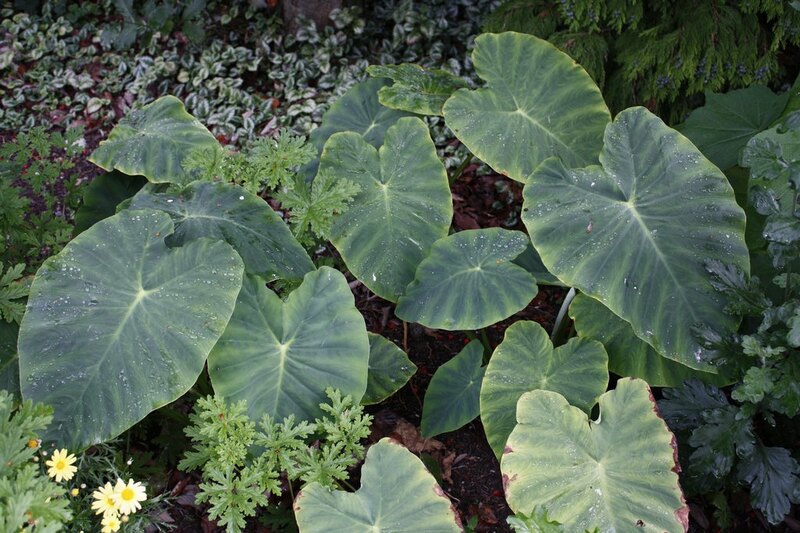 I also think that Tetrapanax papyrifer will be seen as a weed in the UK in years to come. Kris - just checking my information and seems ground elder was introduced much earlier, maybe by the Romans as a food crop and for medicinal use. Tetrapanax as a weed - what a thought!